at 7:04 this morning the winter solstice occurred* which means today is the shortest day and the longest night. as of tomorrow our days grow longer and the path to spring gets shorter. last night we joined friends at s & p's home for their annual solstice gathering. the evening began with a walk to nearby edgewater park to watch the sun set. after saying goodnight to brother sun we turned around to stroll through the neighborhood in the waning natural light and as the artificial lights celebrating the season waxed. once home a convivial evening of conversation, food, wine, and poetry ensued. *for those of us living in the northern hemisphere that is! 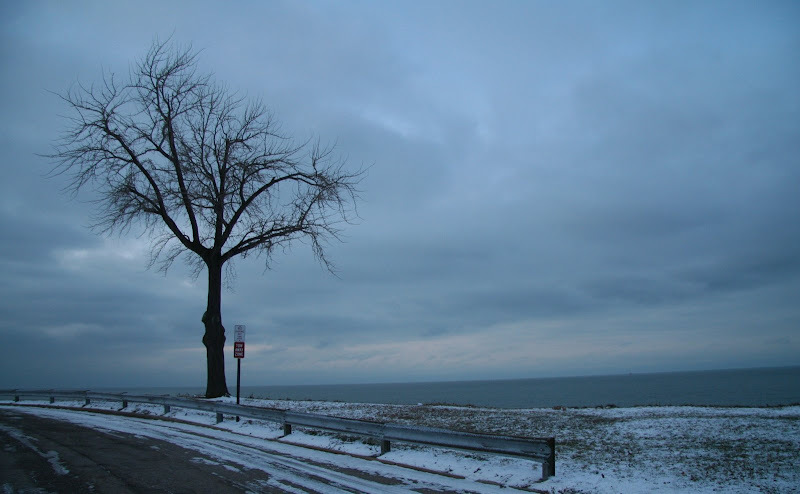 photos: lone tree and lake erie at sunset. 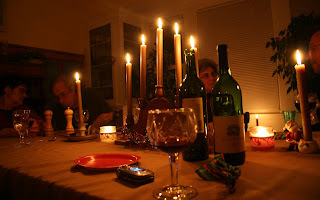 candlelight solstice eve. 20 december 2008, cleveland. Good matchup between the pic and the poem, petite souris. Wishing you a lot of golden light and good cheer. What a lovely time, and sentiment, too. It's good to know that we can now "walk into the light" for the next six months knowing that it's a good thing. A good week to you, Kimy! I'm a walk toward the shorter days, kinda guy. What a great poem. Thanks for sharing. rlb - how long are the days in sunny graulhet? junk - the snow currently falling is helping lighten things up too! tut - and to you happy holidaze!! merle - short or long, as long as you are walking that's good! k - most welcome! best to you and premium t! megan - we would love, love, love to have you at the table! saretta - it was and I didn't even give the low down on the wonderful food - yum!! I've always loved that phrase, that first line, and have often applied it to the fall as well. The photo is perfect for the entire poem. You know, I think the Bee Gees swiped that first line for "To Love Somebody". I always thought that was an awfully good lyric for their skill set! Janis did a great version of that song. I have been sharing thoughts recently with a lover of "winter light" so your solstice greeting fits right in with the conversation. I love Emily, and love this verse, and with the photo and the time of year it makes a perfect greeting. Love to you and all you love -- which seems to be every living creature. Oh Mouse, I read this Emily Dickinson poem way back in school, when I was too young to understand its melancholy depth and beauty. Perhaps I was a happier child than I remember! This time, however, it just pierced me, but in a way that made me feel awed and grateful, because it expresses so perfectly what sundown in winter can feel like (winter also being a metaphor for certain events in one's life). Thank you for sharing again. You are such a lovely spirit, mouse. I am so glad to know you. Ha, my word verification is "matin". The universe bids me embrace the morning light, perhaps?